Matrimonial website is a platform where all marriage seeking alliances meet, exchange information and find a perfect life partner across the globe. One can find his/her prospective partner as per their choices and removing problems that arises due to traditional methods for finding partners. Based of marriage seeking registrations, a potential match is found and alerted to registered persons accordingly. This is the best solution if you are looking to run a matrimonial services website. We have integratedmany features which you can use and take full advantage of the matrimonial services. This is a very powerful online matrimony management package system that we've developed exclusively and user friendly. Interface Software Services has developed the perfect online engine for matrimonial agencies to get online with business in less than four weeks. Our matrimonial web site development tools and integrated administrative software, offers extensive control and flexibility to webmasters. The complete matrimonial web site manager includes features for three types of users. 11. Tell a Friend Facility. Self-profile management section enables a registered user to post content about himself/herself or about the person who wishes to marry using the portal. The matrimony web site manager enables a registered user to provide information through use to neat and well-organized forms. The various sections of profiles include the following details about an individual. Request For delete my profile: Through this system you can request to administrator to delete his/her member profile form web portal. Our matrimonial web site management system offer the most comprehensive profile management enabling users to optionally provide as much data about them and then allow other users to perform searches upon them. Self-photo management section enables upload or delete his/her photo. Horoscope management section enables member to upload or delete his/her Horoscope details. Inter Member Chat Management provides chatting with registered members who is online. Partner profile manager enables a registered user to set preferences for the partner the user is lookingfor and save these preferences. A registered user can save multiple such preferences. The web site monitoring system continuously performs searches on existing database to extract profile matches against partner preferences. The system also performs automatic short listing of candidates from the user database and sends email alerts to registered users. Registered members of the matrimony web site can selectively mark other profiles as favorites. These profiles are then available to them under the favorites section. The matrimonial web site system comes pre-packaged Search Systems like Quick Search, Advanced Search, City Search, Education Search, Occupation search and Profile Id Search with a powerful search system to perform extensive searches on the existing profiles. The administrator account is the all powerful user account of the web site and is allowed maximum functionality in the system. The administrator is enabled to control access privileges of other users as well. L. Registered user Photograph Management. O. View & Reply Feedback/Enquiry Support. Q. View Statistical Report like total no. members, no. of free/Inactive members, no. of Paid/Active members. B. Fixing grammatical / language errors. E. The matrimonial web site system offers an easy to understand and operationally fast panel for moderators to enable them to perform their tasks at maximum speed. 3. Created completely using WIMA (Windows, ISS, MS SQL and Asp.Net), no software licenses required. 4. Fully managed servers, no network administrator required from your end. All-n-all web based system - No permanent software required on your local computer. Any computer with a basic Operating System, web browser and internet connection can be used to administrator, moderate, use or visit the matrimonial portal. The Matrimonial web site system is a full-featured ready to implement matrimonial web site management system that allows you to create the look that you want, and the powerful functionality that the system offers. It’s easy and inexpensive to start and manage it in the long term. A typical matrimonial web site can be setup and launched within 15-20 days from the day you decide to start the project with us. We have a readymade software script for matrimonial website with all advance options and powerful admin monitoring option. 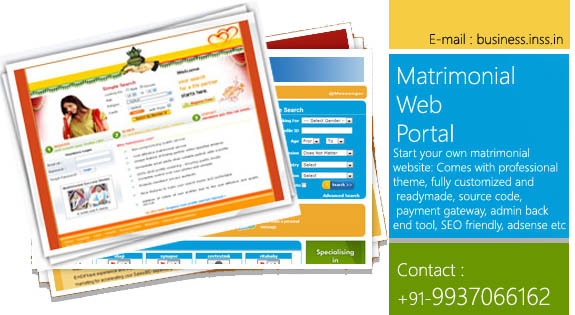 Matrimonial Website Design Bhubaneswar, Matrimonial Web Development Company Odisha , Matrimonial Website Design,Marimonial Software Development,Match Making Software bhubaneswar,Matrimony Website Development Company,Marriage Match Making Software,Matrimonial Web Portal Software Solution,Marimonial Web Portal odisha,Online Matrimonial Website India,Matrimonial Web Management Software Bhubaneswar,Marriage Software Development,Matrimonial Web Development Information Softwate ,Matrimonial Website Designing Company India , Match Making Website Designing Company in Bhubaneswar Odisha India.